Unai Emery has made the defence his primary focus this summer with the arrivals of Stephan Litchsteiner, Sokratis and Bernd Leno, but it looks like another defender is close to joining the club. 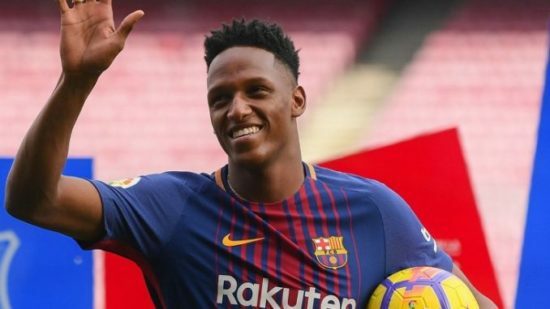 According to TuttoMercatoWeb, Barcelona centre-back Yerry Mina has been offered to Arsenal. The report also goes on to say that the defender is eager to join the English club ahead of the other clubs who are interested in his signature. The Colombian defender made headlines in the last World Cup by becoming the first defender to score a header in three consecutive matches. He also made several important interceptions and was impressive in Colombia’s run to the last 16. Mina arrived Barcelona in January and made just 6 appearances for the Catalan giants as he failed to dislodge the first choice pairing of Samuel Umtiti and Gerard Pique. Barcelona are keen to ship the player out as he currently occupies one of the three non-EU players spot in the club. The arrival of Malcolm and Arthur this summer means that Mina will have to leave the club. Everton had been linked as the forerunners for his signature but it looks like Arsenal are ready to swoop for the £20 million-rated defender. Mina stands at 6ft 5 and has the required pace and physicality required to succeed in England, moreover at £20 million, he is a bargain for the Gunners as he still has many years left to develop his game.